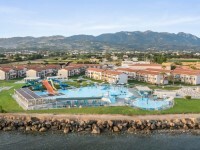 LABRANDA Marine Aquapark Resort, a club resort ideal place for a splendid and memorable family vacation. For large bathing fun besides the nearby rocky beach and the unique pool scenery amidst the spacious gardens and especially the Aqua Park with water slides & wave pool. 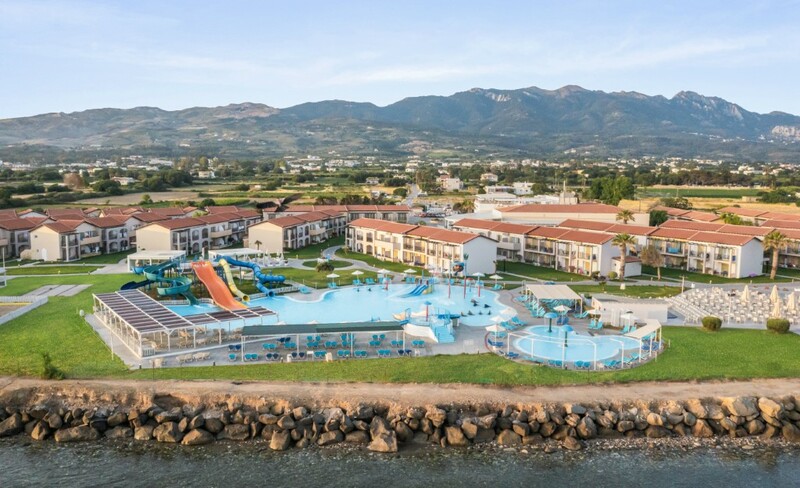 Located in Kos Island, 19Km from the Airport, 6km from Kos Town, 2km from the Restaurants and shopping area.LABRANDA Marine Aquapark Resort, waterpark consists of four pools and is the paradise for families with kids and teenagers. It is strategically located in the centre of the resort, right in front of the beach, and is supervised by a lifeguard.Lotus Pool is a leisure swimming pool located in a quiet area behind the Poseidon Adventure wave pool. Poseidon Adventure Wave pool is a large swimming pool of 1850 m2 surface. Every hour from 10:00 to 18:00 hours there is 15-minute wave session. Olympus Theme pool has five different big slides such as black whole, swirl, kamikaze etc. It has also three medium size slides for the younger ones. It features a pirate theme with water showering mushrooms and water curtains and some mini slides. Access to the slides is supervised and allowed according to height. Children's Pool is situated next to the Olympus theme pool and features two showering mushrooms. All Inclusive program is available from 07:00 hrs until 24:00 hrs and is valid until 12:00 hrs on departure day.Meals:Early Breakfast (Open Buffet, Main Restaurant) 06:00 - 07:00 hrsBreakfast (Open Buffet, Main Restaurant) 07:00 - 10:00 hrsLate breakfast (Open Buffet, Main Restaurant) 10:00 - 11:00 hrsLunch (Open Buffet, Main Restaurant) 12:30 - 15:00 hrsSnack Bar 12:00 - 18:00 hrsDinner (Open Buffet, Main Restaurant) 18:30 - 22:00 hrsMidnight Snacks (Main Restaurant) 24:00 - 07:00 hrsSpecialty Dinner: 19:00 - 22:00 hrsIce cream for children is served at dinner time in the mainrestaurant.Specialty restaurants included in All Inclusive:Italian Specialty Restaurant (once per stay)Greek Specialty Restaurant (once per stay)Beverage:Calypso pool Bar 10:00 - 01:00 hrs ($ after 24:00 hrs)Pan Main Bar 17:00 - 01:00 hrs (with charge after 24:00 hrs)Restaurant Bar Open - breakfast, lunch and dinner times.